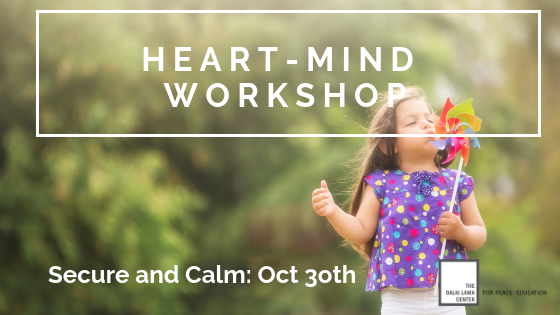 Join us for our Heart-Mind Well-Being: Secure and Calm Workshop on October 30th, 2018. We know from research that the early years (0-6) are a critical time for the development of self-regulation, a time when responses to stress are “wired” creating patterns that can be hard to change later in life. What matters most in these early years is for children to feel safe and secure, and be able to count on their caregivers to calm them down when they are frightened, upset or distressed. This workshop will focus on strategies for creating safe and supportive environments for children as well as on tools such as conscious breathing and mindfulness that can be used to help children develop skills for self-regulation. The workshop will be of interest to anyone caring for children, including parents, early childhood educators, family support workers, and other service providers.